When Family Guy wanted to parody the musical Annie in the episode, Peter, Peter, Caviar Eater, the writers originally planned on using the musical’s original tune I Think I’m Gonna Like It Here. Somehow along the line, someone got it into their head that instead of paying for the rights to a pre-written song, they could easily write a parody that aped the song’s style. That song started a grand tradition for Seth MacFarlane of musical numbers throughout the show’s history, which then carried over to the writer/director's films. 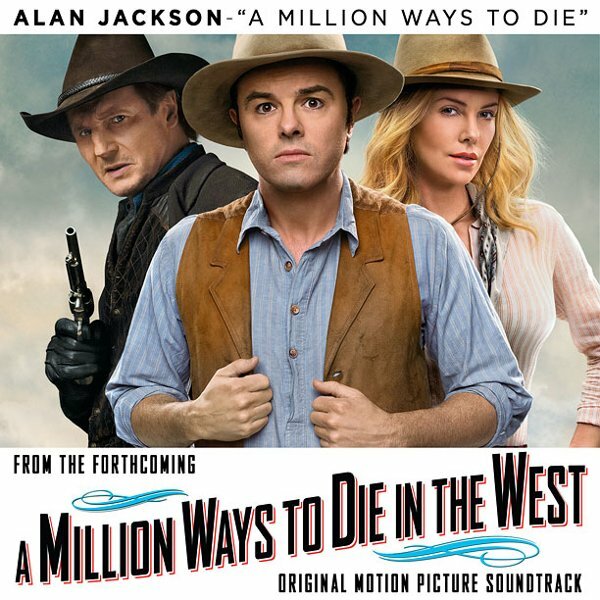 His latest musical collaboration, the title track to his next film A Million Ways To Die In The West, seems destined for another Best Original Song nomination at the Academy Awards. At the very least, it will inspire some very well timed laughs in theaters worldwide. Thanks to Entertainment Weekly, the world now has its first chance to listen to the single MacFarlane produced with country music vocalist Alan Jackson. The song is written in a cross between a sweeping Western epic like The Magnificent Seven, and a classic piece of gallows humor like Johnny Cash’s 25 Minutes To Go. Specifically, the horn section recalls a darker version of the former influence’s scope, while the Seth MacFarlane lyrics and Jackson’s vocals invoke the latter. It sounds like a song ripe for the opening titles, which helps the listener imagine just what the twisted minds behind this film are going to do to accompany such a tune of western death and despair. While his story writing and humor might not always win the day, Mr. MacFarlane’s lyrical writing has always been extremely creative. He’s clearly influenced by classic Hollywood throughout all of his work, and whatever other influences he needs, he picks up along the way of the creative process. Teaming up his darkly funny material with Alan Jackson’s deadpan delivery only sells the song with enriched sincerity. Of course, the patented Seth MacFarlane charm still works best in its default, jazzy setting. This is best shown in the Academy Award-nominated tune MacFarlane wrote with frequent collaborator Walter Murphy, Everybody Needs A Best Friend. Whether the film lives up to that sincerity has yet to be seen by mainstream audiences, but audiences will have their chance to experience it for themselves when A Million Ways To Die In The West opens on May 30th.